I raised my hand. Luckily, a couple of the other members of the group wanted to see the Neolithic graves with their Bronze Age standing stone circles, too. So a handful of us got off the bus bundled in raincoats and toting umbrellas. And the place was magical! 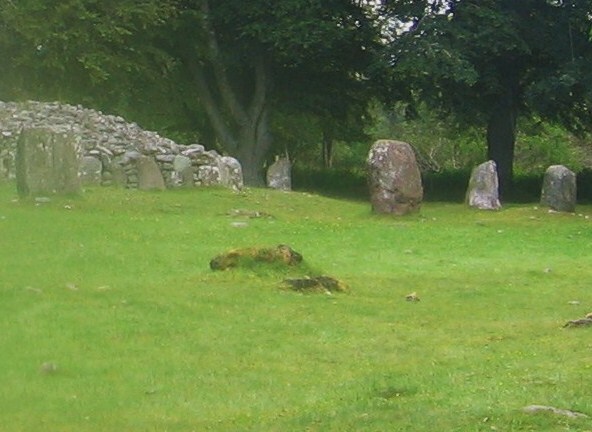 Balnuaran of Clava is one of a number of prehistoric cemeteries built more than 3,000 years ago in the Inverness region of the Highlands near the River Nairn. It’s surrounded by woods and farmlands — and on that gray afternoon, it was quite lonely. I took out my camera, doing my best to shield it from rain, and snapped a few pictures before the bus driver beeped the horn and summoned me back. But I could have stayed much longer in that misty woods. There were 3 stone cairns or graves. The one closest to the parking lot was a passage cairn. 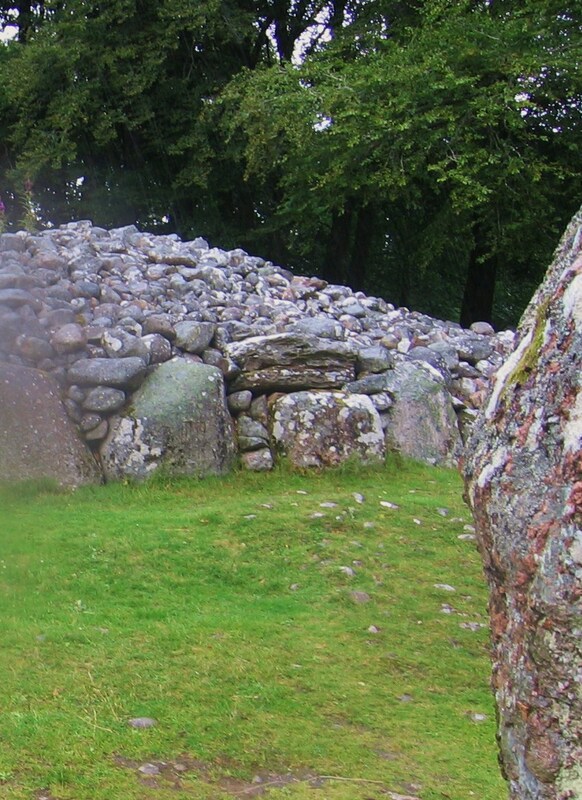 The central grave was a ring-cairn with no entrance into its pile of stones. And the grave furthermost from the parking area was also a passage cairn. According to authorities, each grave was constructed for a single individual, and as I touched the moss-covered, lichen-riddled boulders, I felt the ancientness of the site. And I felt it was alive with the unseen. When I stood at the entrance to the far Southwest passage cairn, it became evident that it aligned with the entrance to the Northeast passage cairn. Later, I learned that alignment marked the Midwinter sunset. Perhaps the astronomical meaning was part of the magic I felt. The construction of the cairns seemed a bit haphazard at first glance, but upon looking closely, I could see stones were carefully stacked without mortar of any sort. To help stabilize the smaller rocks, large boulders had been placed around the outside of each grave as kerbs. 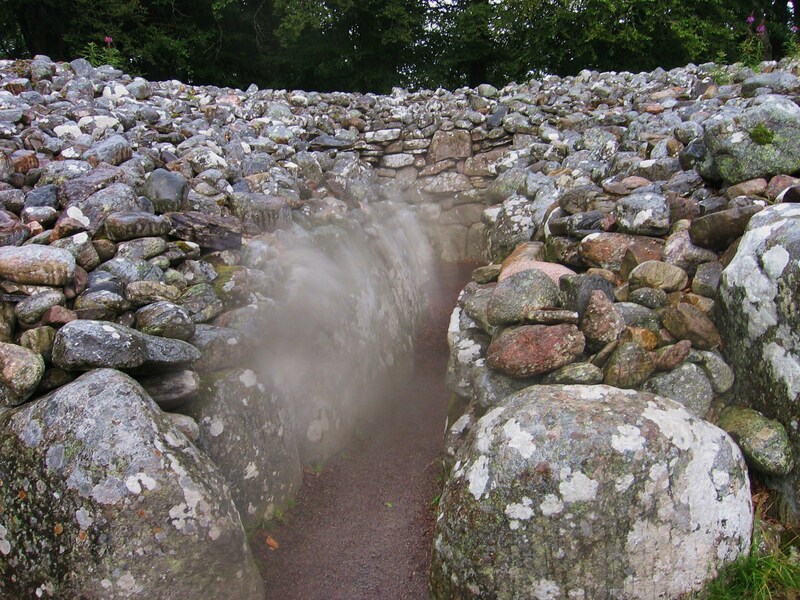 As I examined the interior of one of the passage cairns, I could swear I heard a murmuring of voices along with the raindrops pelting rocks, leaves, and my raincoat. 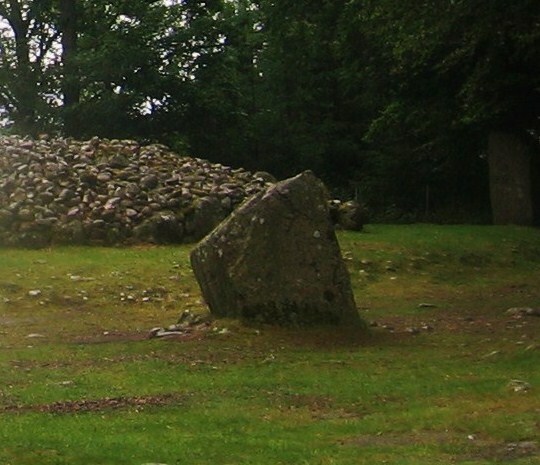 Then, I noticed one of the standing stones that surrounded each cairn was split. For what purpose? I had no idea. But the writer part of me imagined it was a gateway to Faerie or the past or another dimension. 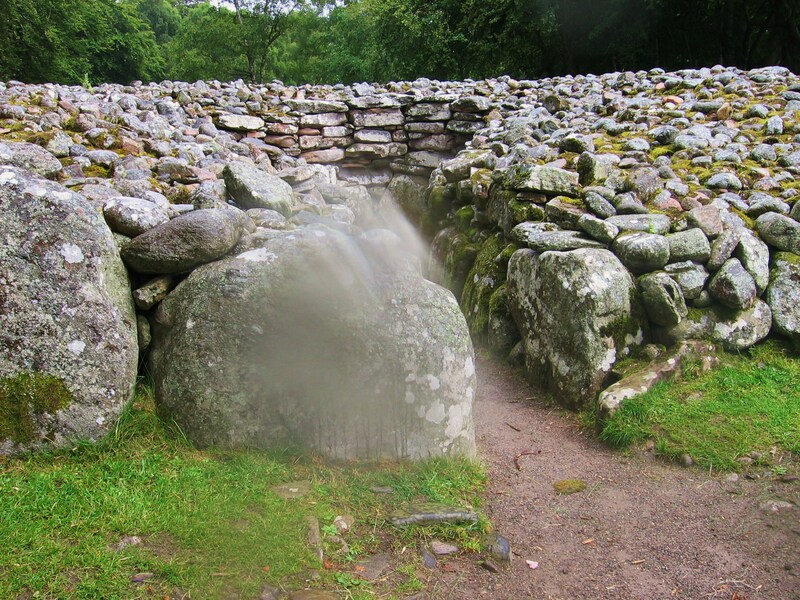 So I snapped a quick picture as I realized I was the last person at Balnuaran of Clava. “I’m sorry I can’t stay longer,” I whispered to the spirits that seemed to hover nearby. I did not take a pebble or even a blade of grass away with me. To do so seemed wrong. 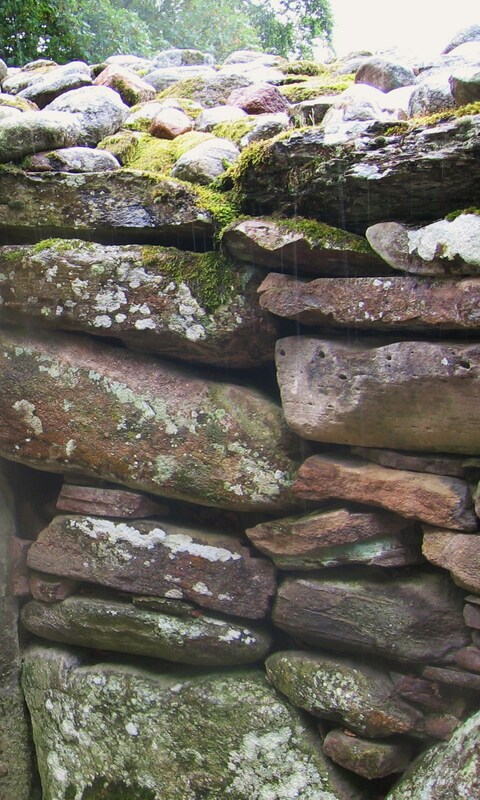 Later, I heard one of the locals say that a tourist once took a rock from Balnuaran of Clava home and suffered so much misfortune that he later mailed the rock back to the Inverness Tourist Board. Perhaps the story is a bit of foolishness — but I had known not to take from the unseen amongst us. Because I got off of the bus that day in Scotland when others chose to remain warm and dry — I saw the magical. I experienced the mystical. And perhaps, I even caught some of that on film! The images published here have not been altered. The blurred areas in some of the pictures are most certainly raindrips or condensation or faulty photography of some sort. Or perhaps not. 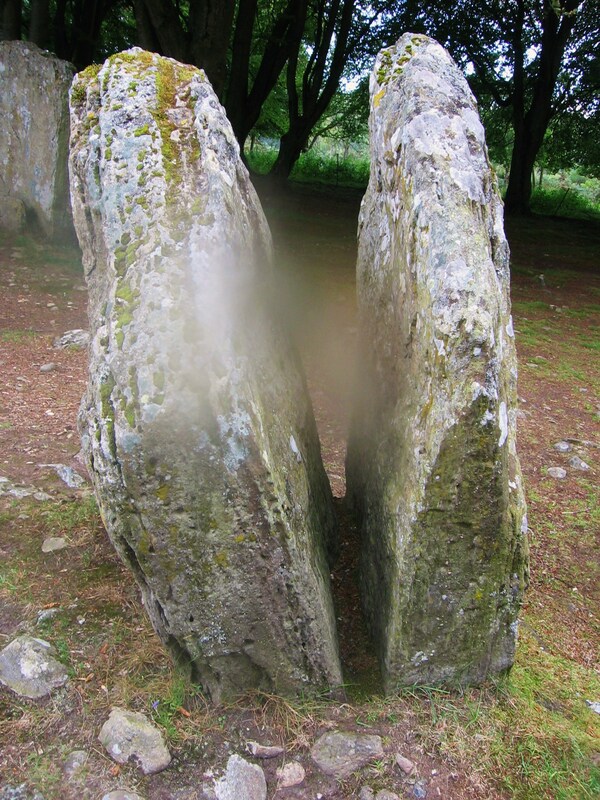 I leave it to the viewer of these photographs and others who’ve visited the ancient burial and astronomical site of Balnuaran of Clava to decide for themselves. As for me? I still believe the mystical and magical are all around us. And I write about it in my books: The Greener Forest, Owl Light, The Enchanted Skean, and elsewhere. (And here’s the Link for UK readers).